He's the guy who's got the cushiest job in the Fur Rondy parade and the least of costume quandaries for the Miners and Trappers Ball: Lord Trapper, Marc Langland. "I get to wear the big fur coat," he said with a laugh. "It makes it a little easier, particularly if it's going to be cold in the parade." 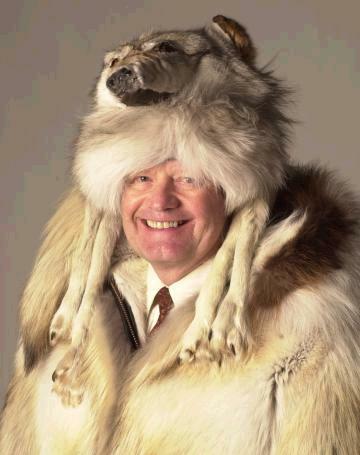 Langland, a longtime Alaskan who's a founder and the top executive of Northrim Bank, once dressed as an animal in a Miners and Trappers entry of yore called "Cal Worthington and His Dog Spot." This year, he's on Easy Street with the wolf hat, staff and ready-made fur parka provided by David Green Furrier. Same with Lady Trapper, Doris Lake. Langland doesn't know his "lady" yet, except from her history and connections, though he did meet her husband, the late Orville Lake. The Lakes are well-known in the mushing community. They have been key players in sled dog racing in Alaska for decades and were charter members of the Alaska Sled Dog Racing Association. Doris and Orville Lake mushed in the Rondy races, which have been on and off for the past few years because of the weather but are scheduled to take place this year. Doris Lake served as a timer of the World Championship Sled Dog Race for many of the years between 1951 and 2002. She moved to Phoenix last year, but still has family in Alaska. Today she'll be riding not a sled but a horse-drawn carriage with Lord Trapper at the front of the parade as the celebrity ambassadors of the Fur Rendezvous festival. The Lord Trapper role was established in 1981 and Lady Trapper in 1994. They are chosen by former Lord and Lady Trappers at an annual luncheon. "It's a very nice honor," said Langland, the chairman, president and chief executive officer of Northrim BanCorp Inc. "I appreciate it very much." Langland added that he was flattered when he found out he'd been chosen. The leader in Anchorage's financial community and board director for several large corporations has received other local honors: an Anchorage Chamber Gold Pan, a place in the Alaska Business Hall of Fame and a long-standing spot on Alaska Journal of Commerce Top 25 Most Powerful Alaskans list. So what do lord and lady do? They will attend the big Rondy events, such as the parade, Masque Ball, the Jim Beam Jam, Miners and Trappers Ball and the sled dog race finals. It's a busy schedule, Langland said, but worth it because it's good for the community. "From a dollar standpoint, it's sure to be a big number," he said noting the festival's tourism aspect. "It's very strong for community-building," Langland added, and has value in highlighting Alaska's cultures and bringing people together. "In the wintertime, when people are coming off a long winter and short days, I think it gets people's spirits up. It's a real participative type of activity, which I think is good for a community."